What happens to your business when you’re not in the mood? We all have days, and weeks, when we’re “not in the mood” to work, to talk, to play, to network, to do business, to serve customers. Really, it’s true. Don’t hide. 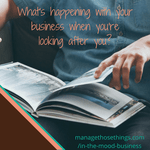 So, what happens in your business when you’re not in the mood? I’m asking rhetorically really. You don’t have to confess, unless that will be helpful for you. I guess I’m asking you to reflect and review your business, and all aspects of it, so that when you are having an “off day”, your customers won’t notice, and your systems will pick up the slack. Support team. Having a support team around you is crucial. Whether it’s family, friends, or staff (on-site or remote), people who can pick up the slack, or the important tasks when you’re not around will help keep customers happy and the business running smoothly. Email auto-responder. Setting this up, as soon as you know you’re not “in the mood”, will ensure that you can get on with getting yourself back on track, and customers can be still be served efficiently. Do you have another team member you can encourage emailers to contact, using a click through link ideally – a general office email that you know will be checked? Answer machine message on your phone. This should be fairly easy for you to set up, and amend as your circumstances change. Again, referring callers to another number which will be answered, or giving a clear idea when you’ll get back to them, will help keep everyone informed and happy. Ordering supplies automatically. Whilst you want to control costs, there’s nothing worse than running out of milk, or toilet rolls is there? So, having some stock items for staff, or for your customers, on regular order that you check every couple of months in your stock review, will ensure nothing is missing, even if you are. Directory of contacts and contractors. When you’re not in the office, can your team contact your IT support, or plumber, or suppliers, to ensure that the business can function. Having a list of contacts and approved contractors, (even if they are your friends who help out), will ensure that if your partner has to take control whilst you’re unwell for a short time, they can do what they need to keep things running smoothly. Your contacts and contractors will also be more sympathetic as you’ll have built a relationship with them which always make things run more easily. Be honest….as honest as you can be. With yourself as well as those around you in your family and support team. 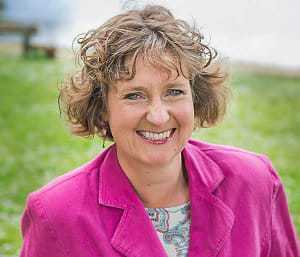 If ‘life stuff’ is happening sometimes we don’t know what’s going on, so regular reviews of how best to run your business with the facts you have about your situation will serve you, your customers and your business in the best light. If you need to cut your hours, be honest. Cut them. You can only do your best, and be your best if you have the right energy and support to carry out your business tasks. Every business is different, and each of us as business owners will react in a different way to the situations we face day to day. Whilst we are our businesses, our business can often function without us being involved 24 hours a day, or 7 days a week. I often say to clients, “what happens when you go on holiday?”. If we can sort out the right support and structure for our business to run whilst we’re away on holiday, we can put systems and support in place for those times when we’re not in the mood, due to life’s little challenges. Whilst being “in the mood” for business may sound flippant, we’re being honest. We’re just trying to get you to think about the wonderful customers you’ve got and how they’re going to be supported if you’re not around. The Business Cheerleading Club could be part of your support structure. A safe place for your support, and also ideas as to how you can get the right support whilst you’re away, or not on top form. You never know, you may even meet your ideal assistant, or collaboration partner there! That’s certainly been our experience so far. What tips would you add to our list? What do you do to ensure your business is always in the mood?